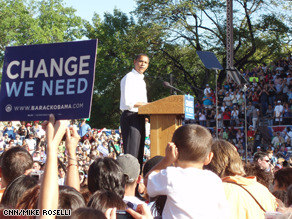 Obama delivered his remarks at the Colorado State Fair of a teleprompter. (CNN) - It appears Barack Obama's teleprompter is hitting the campaign trail. But the Illinois senator used a teleprompter at both his Colorado events Monday - making for a particularly peculiar scene in Pueblo, where the prompter was set up in the middle of what is normally a rodeo ring. I can't imagine giving a speech off-hand having only a few hours of sleep a night for 3 months in front of thousands of people. Seriously...this is an issue, why? THIS IS NOT NEWS! Wow I new low to the right wing biased news. Well, finally the truth comes out about Obama and his regular use of a teleprompter–after 2 weeks of media huffing and puffing about Gov. Palin using a teleprompter as if no other candidates has ever used one. So what if Obama uses a teleprompter on the campaign trail. And, of course, the elitist Conservatives are going to belittle someone for using high tech props.....and continue to ignore the real issues! Such childish antics for anyone to denounce someone because they use teleprompters. Are you kidding me? Why is CNN not reporting that Ms. Palin also used a telepromter? Or why isn't there more information about John McCain and his cue cards since we know he can't read a telepromter? What's up CNN? So what? At least Obama can give a speech without one and he can write his own.He doesn't have someone whispering in his ear. All politicians use teleprompters, although Obama answers questions at town hall meetings without scripts–something that McCain has long since ceased to do. cnn if McCain gets elected, you'll be to BLAME!!!!!!!!!! OMG So what? Geez...stop focusing on the Lipstick and stick to the issues...CNN just like McCain "sleazy"
Oh, at least make an attempt at being fair. Didn't Gov. Palin use a teleprompter on the tarmac upon her return to Alaska the other day? Doesn't McCain use one?!?! In other words: GIVE----US----A----FRIGGIN'---–BREAK! Sarah Palin used one. So does McCain. At least Obama can read. Heck, Sarah stumble and bumbles, and McCain doesn't have the eyesight to read his so he reads from a paper plopped in front of him by a speechwriter. this is news?...politicians have used them for years. Big deal. Please all obama voters. On election ballot vote"Present"
AMERICA'S LOVE AFFAIR WITH SARAH, WAS A ONE NITE STAND! McCain: ”We will stop multi-million dollar payouts to CEOs who have broken the public trust”. Does this mean that Carly Fiorina your new BFF, who took $21 million in cash as her departing gift after running HP into the ground, will be tendering her resignation? Oops, hope that wasn‘t “sexist“. All the McCain supporters better jump on that Obama uses a teleprompter, (big cheers) we got him on the run now! When McCain thinks the economy is strong and now he has to clarify what he meant, lol. Maybe he should drop the q-cards and get one. Let's get to the issues!! !